*UPDATE: It has been several years since I wrote this review and I have since received an updated Redsun model with English labelling and the C.Crane CC Radio-SW version. I am happy to report that they perform similarly so my recommendation is that US buyers purchase the C.Crane version since it is available locally and should you have any problem in or out of warranty you won’t have to ship a radio to China for repair or replacement. 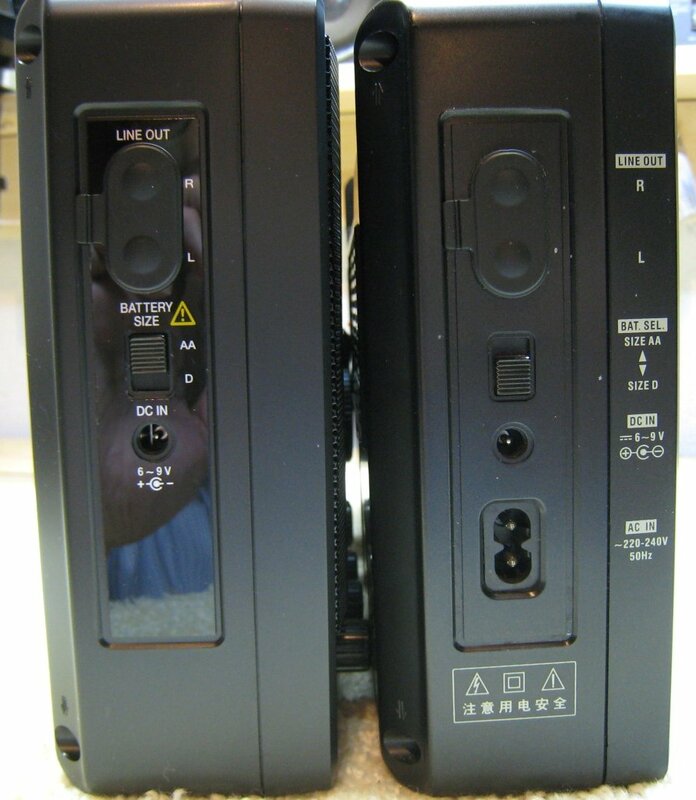 If you buy the Redsun version be aware that they are available with Chinese or English labelling and with either 120 or 220 volt power supplies built in..be sure you order the correct version for your area. The Redsun was also available as the Kaito KA-2100 but that appears to be no longer available. I have also seen a Silicon scientific 75498 and a Roadstar TRA-2350 version which seem to be identical except that they have no memories. In other areas the RP-2100 is also known as the ELTA 3569 and perhaps other versions exist as well The following original review has been updated to reflect current information. 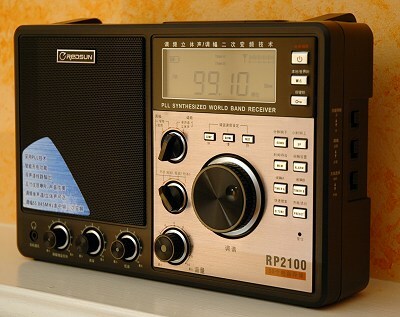 The RP-2100 reviewed here is available on eBay from China. 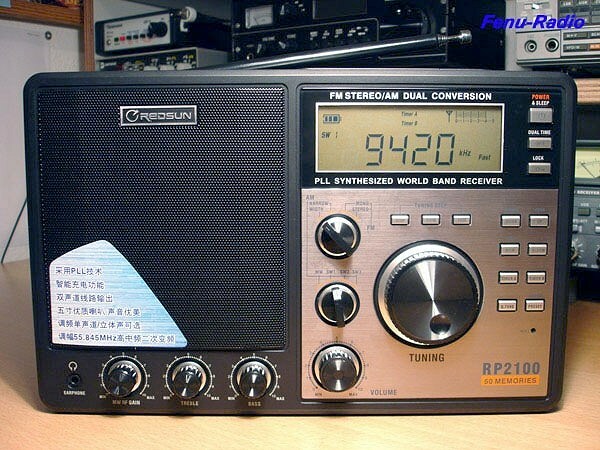 The similar C.Crane CC Radio-SW is available from C.Crane : http://www.ccrane.com/ and other retailers and sells for approximately $140. The main difference is that the Redsun contains a built in AC power suply (either 240 or 120 volts depending on version) while the C.Crane version uses an external wall-wart power supply. Performance comparisons and individual unit inspections indicate that otherwise the radios are essentially identical. When introduced the RP-2100 was the subject of much speculation as a candidate to unseat the Eton S-350DL/Tecsun BCL2000/3000 radios from their position of pre-eminence in the world of approximately $120 lunchbox sized multi-band portables. In this report we’ll compare them side by side along with several other worthy portables to see exactly how they stack up. The results are interesting to say the least. 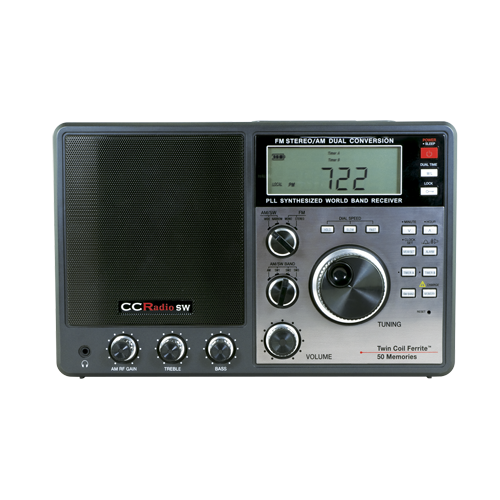 The CC Radio-SW/Redsun RP-2100 is a large multi-band portable measuring approximately 11 ½” x 7 ¼” x 2 ¾”, or 290 mm x 185 mm x 70 mm. It is in the same general size category as the Eton S350DL and E-1 radios which is my favorite size for an around-the-house portable radio. They’re small enough to be easy to move about yet large enough to offer good RF performance, good sound and be easy to use. 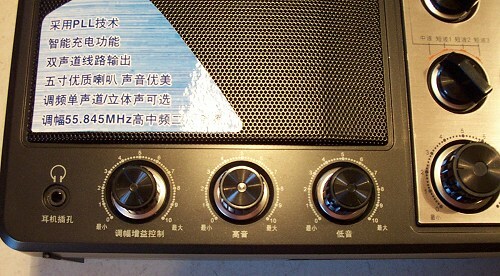 Controls: The roomy front panel contains the large Tuning knob, to its left are the mode and band selector knobs with the Volume Control at the bottom. 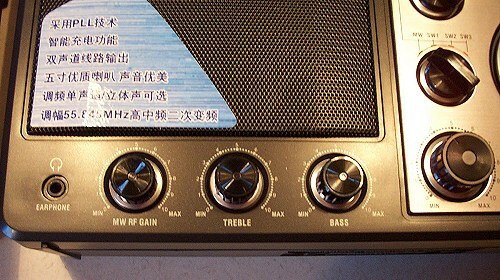 The smaller knobs at the lower left are RF Gain, Treble and Bass, and a 1/8″ Stereo mini jack for headphones is at the far lower left. Above the Tuning Knob are three push buttons for: Stop (a tuning lock), Slow and Fast tuning. To the right a group of 8 push-buttons control Down & Up Tuning/Seeking, Memory, Alarm, Timers 1 & 2, Q. Tune (SW Band on CC-SW). A the top right are three buttons for Power/Sleep, Local/World Time and Lock which disables all functions except the Light Switch. You can display World or Local Time momentarily while the radio is on. On the top panel are a Light Switch (which can turn the lights on for 8 seconds or lock them on) and a Snooze Bar. Pressing the Snooze bar with the radio off defeats the Key Beep feature. (An undocumented feature is that the end of band beep can be defeated by pressing the Alarm Button with the radio off. This trick works on my CC-SW but not on my Redsun RP-2100). It may work on more recent versions of the Redsun. The left side contains RCA Stereo Line Out jacks, Battery Size Selector, DC and AC Power in jacks. 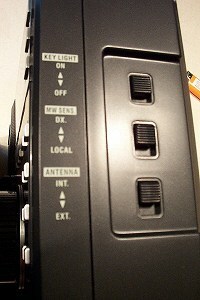 The right side contains switches for Button lights, DX/Local and Internal/External Antennas. The Button Lights switch allows the push-buttons to also illuminate when the dial light is on, evidently a power saving feature. 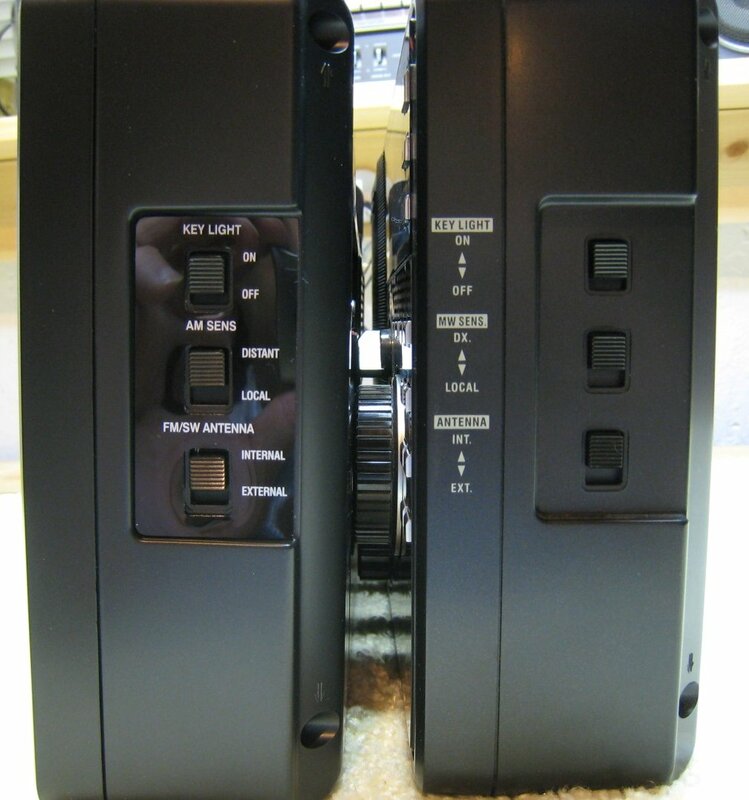 The back panel contains two Pal Connectors: One an external FM/SW antenna input, the other an AM IF Output jack for connection to an outboard SSB or DRM decoder, and spring loaded connectors for a MW (AM) antenna. Inside the battery compartment which will let you load 4 AA and 4 D cells (simultaneously if you wish), is the 9/10 KHz MW Step switch. Basic Operation & Initial Impressions: The CC/Redsun is easy to use after a short time spent getting to know it. The high points are: excellent RF performance on all bands, excellent sound, solid feel and good tuning via the knob. It has an attractive fold-away handle – C.Crane also offers a nice optional carrying case. It was immediately apparent that reception was sensitive and strong, and the audio likewise impressed me immediately. Compared with my other similarly-sized radios the CC/ Redsun offers a full, warm sound with plenty of audio punch and excellent clarity. It’s rated at 2.5 watts on AC power…even if it’s half that on battery power, it is enough to fill a large room authoritatively and pleasantly. It sounds better than my Eton S350DL or E-1…the only portables I have which sound better are the Superadio series, The ITT 103 and Hacker RP-25/35. The two IF bandwidths are given as 6 KHz and 3 KHz and appear to be well-chosen for program listening. The Wide mode is fairly wide…it lets stronger AM/SW signals retain a natural sounding clarity, while the Narrow filter similarly seems well chosen to eliminate interference under most conditions while maintaining as much clarity as possible. I also noted excellent AGC range…as I tuned weak signals the CC/Redsun maintained full volume on weaker signals while I had to advance the volume a bit on the S350DL to match it. The eventual reception was actually not very different, but the superior AGC range of the CC/Redsun made it seem more sensitive. I also have to say that comparing with my S350DL, the CC/Redsun was decidedly easier to tune on SW…the ’350 is just more finicky to get it tuned just right…the CC/Redsun locks onto, say 9515 and stays there. By comparison the S350 series are much fussier to tune on SW than they are on AM and FM. 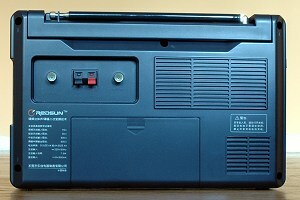 Tuning: The CC/Redsun is unique in that it is a PLL design (digitally tuned), yet it has no keypad for Direct Frequency entry. This seems like a serious omission in a day where PLL portables with keypads are common. Also, the 50 Memory positions are limited to 10 presets per band. This is not a problem to someone like me who uses memories only for a few stations, but curious given the fact that lesser radios offer hundreds of memories these days. 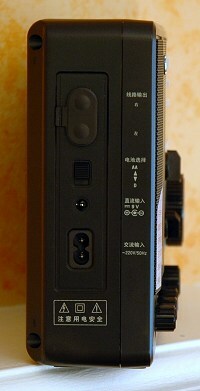 However, a quick look at the pictures of the vintage Panasonic RF-2200 and the Grundig/Eton S-350 series radios reveals the concept of the CC/Redsun: to mimic the operation of these analog receivers but with digital technology for consistency and accuracy, while maintaining a top level of overall RF and audio performance. The design makes perfect sense when looked at in that light. The CC/Redsun divides the SW spectrum into three bands, SW 1, SW 2 and SW 3, similarly to those analog radios. With no keypad it takes several seconds to twist the dial from one end of a SW band to the other, although tuning is quick and easy on FM and FM. However, you can navigate quickly with the “Q. Tune/SW Band” button. It allows you to step through SW bands or segments of the AM and FM bands quickly. So if, for example, you’re on SW 1 (1711 – 10010 KHz), pressing “Q. Tune/SW Band” steps you sequentially through 2250, 3150, 3850, 4700, 5800, 7100, and 9400 KHz, the nominal starting points of the 120 meter through 31 meter bands. It performs similar duty on SW 2 & 3 as well as AM and FM where it steps you through 100 KHz AM and 1 MHz FM. This eliminates the need for heavy duty knob spinning and becomes natural after a short period of use. The tuning action via the knob is not quite noise-free. It is mute-free which means you can tune without fear of missing anything, but there are some minor spurious noises while tuning. However, overall the set has a nice feel when you are scanning the bands…the two tuning speeds seem about right and final tuning, with its PLL accuracy, is infinitely easier than on its analog predecessors. Also note that as battery level drops almost to the point where the unit shuts off, just before that point the tuning becomes a bit touchier. I wondered what was going on at which point the radio switched off due to low battery. I don’t consider this to be an issue but it’s worth noting. Another feature not possible on the analog-tuned S-350 or RF-2200 is that each band (AM/FM/SW1/ SW2/SW3 “remembers” where you were last tuned within that band, so you can be listening to your local AM station on 600, tune away to check out some shortwave on another band, but when you switch back to AM the CC/Redsun will be right where you left it on 600 KHz…this is very handy and is a nice feature. The same is true of all three SW bands and FM. The push buttons require solid pushes. Interestingly, they are clicky buttons, but the click does not necessarily indicate that the switch has been activated. If you don’t hold the button for about a second, it won’t actuate, although you will still hear and feel the click. Not a biggie – the delay seems to be in the software itself rather than in the switches and affects every front panel switch identically. It’s not a problem once you get used to it, but quick taps on the switches will be ignored. FM Stereo/Mono: The CC/Redsun delivers Stereo FM at the Headphone and Line Out jacks, but there is an oddity. Be sure to keep the FM Stereo/Mono switch in Mono at all times when using the radio with its built-in speaker. If you leave the radio in Stereo you will hear only Right Channel audio from the speaker…normally you would hear a mono mix of the two channels, but the CC/Redsun does not do this. You will also not get the improved reception mono mode often provides when signals are less than perfect, so be sure you keep the switch in Mono. Again, it’s not a problem as long as you’re aware of it, but it is unusual. Illumination: I have to say the lighting is dim and works a bit differently than you may be used to. First there are two buttons for controlling the lighting; the “Button Light Switch” on the right side which enables or disables the Button Lights…this seems superfluous. 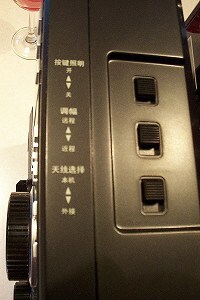 Additionally the main “Light Switch” on the top which controls the LCD display lighting. One oddity though…if you lock those lights “On”, they only stay on until you operate any of the controls…then they revert to the 8 second on/auto off mode…kind of annoying. But be aware that if you lock the lights “ON”, they will stay on, even after you turn the radio off…this has happened to me a few times. Unfortunately, the dial lighting is also rather dim…it’s good enough to let you operate the radio in the dark but its difficult to tell if the lights are on under typical room lighting. Several times I have returned to the radio to find I left the lights on. The S-350DL display lighting is much brighter and really stands out compared with the CC/Redsun’s display. I do like the CC/Redsun’s lighted buttons though. Battery Level Indication: The CC/Redsun can operate on either AA or D cells. I noted that the level indication is conservative. It is a 3 segment meter, but the third segment drops out rather quickly after new batteries are installed. Again, not a big problem…with any radio one must learn the characteristics of the metering, but I would judge this meter to read a bit lower than reality. I ran several comparisons with various other radios to get an overall impression of how the CC/Redsun performs. All tests were done with fresh batteries and built-in antennas only. The CC/Redsun acquitted itself very well overall. First test: CC/Redsun versus Eton S-350DL and Eton E-5. With all the comments on the internet as to whether or not the CC/Redsun succeeds where the S350 series fails I had to compare these two radios first thing. I added the E-5 because it is presently one of the most sensitive radios in its smaller size class, although it retails for around $150 so I wanted to see how it might compare with these larger yet less expensive portables. AM Reception: The CC/Redsun demonstrated virtually identical sensitivity and selectivity compared with the S-350DL. Again, the CC/Redsun’s superior AGC makes it seem more sensitive because weaker signals maintain the same volume as the strongest signals, while they are a bit quieter on the S350, but when you turn up the volume on the S350 to compensate, the resulting reception on AM is the same. This is a point easily missed when comparing radios. The E-5 was definitely a notch lower in AM sensitivity…the weak signals were not only lower in volume but also had a higher noise level. It was much more finicky to tune the S-350 and S-350DL than either of the digitally-tuned sets, but again, on AM the S-350′s tuning is not hard to live with at all. It’s more touchy on SW as you would expect. SW Reception: Here there were a few variations from one frequency to the next. I checked several weak to medium strength signals across the SW spectrum. The CC/Redsun sometimes outpulled both the S-350 and the E-5 noticeably, but on other signals they were very close. Most weak signals sounded best on the CC/Redsun…full audio levels and the lowest background noise. This is one sensitive SW portable. Also since the S-350 is the only single conversion radio in this comparison, it does suffer from images which the dual conversion CC/Redsun and Eton E-5 do not. This manifests itself as out-of-band images of signals where they should not appear. Potentially these images can interfere with a desired signal, although generally they seem to be most noticeable when tuning between bands – they do not generally ruin reception of the major international broadcasters. FM Reception: Here again the CC/Redsun excelled. In my suburban location the FM dial is crowded and the number of stations I can receive is often more a matter of selectivity than sensitivity. However there are many out of town signals which are a good test for pure sensitivity. The CC/Redsun was the best of this group on both counts. The E-5 was second and the S-350 the least sensitive or selective. The CC/Redsun delivered more clean signals with no noise or interference problems. Second Test: CC/Redsun versus Eton E-1. Admittedly an odd combo to compare…the E-1 sells for $500 and is loaded with performance-enhancing and convenience features not found on the CC/Redsun – they simply are a different class of receiver. Although the E1 shines with external antennas, I was curious to see how they might compare on the basic parameters of performance: whip sensitivity, sound quality and general ease of use. It seemed fair and I was surprised at what I found. With whip antennas the CC/Redsun was noticeably more sensitive than the E-1. Many signals had a quieter noise floor and greater apparent sensitivity. On AM the comparison changed depending on the ambient RF noise levels. Inside my home, with typical levels of background noise, the CC/Redsun was decidedly better on AM…the E1′s whip antenna received considerably more interference making weaker signals unpleasant to listen to. However, outside in the yard where the last vestiges of noise were gone, the E-1 proved itself to be slightly more sensitive on AM…weak and medium strength daytime signals from 100 or more miles away had a quieter noise floor on the E-1…it’s AM is great off the whip when there is little RF interference. The CC/Redsun also proved to have better audio than the E-1. Although I like the sound of the E-1, the CC/Redsun has a wider frequency response. Of course, the CC/Redsun also has a handle, making it far easier to carry around than the E-1 which lacks one. Please don’t construe this to mean the CC/Redsun is overall a better radio than the E-1…that is not my feeling at all. The E-1 excels at virtually every other measure of performance in areas such as dynamic range/overload rejection, filter symmetry and shape, tuning ease and accuracy, memory capacity and organization, SSB, synchronous detection, passband tuning, XM Satellite capability and on and on and on. In many cases the E1 will deal with hard to hear signals far more effectively rendering many signals clearly you will not be able to hear on other portables, especially with external antennas. But be aware that for conventional listening off the built-in antennas, the CC/Redsun has its own areas of superiority and that alone is amazing given the price differential separating these two. AM Reception versus the GR SR I/II, SR III, & Panasonic RF-2200: The GE SR’s and Panasonic RF-2200 are among the hottest of all AM portables ever made. They also have very big sound for their size, which is a bit larger than the other radios we’ve been talking about here. I found the CC/Redsun’s AM reception every bit the equal of the SR III but a bit less sensitive than the venerable SRI/SRII and RF-2200. Those radios provided a slightly lower noise floor on weak to medium strength signals, but still this is excellent AM performance. The CC/Redsun also gives you the benefits of two IF bandwidths, an RF attenuator and digital accuracy so no apologies for AM performance are needed…the CC/Redsun is only a notch below these highly respected radios on the AM band which means it is better than most of what’s out there today. 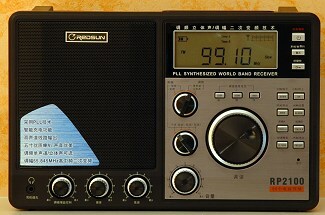 In comparison to C.Crane’s non shortwave offerings, both the CC Radio-2 and CC Radio-EP offer slightly more sensitive AM reception than the CC- Radio-SW, but among shortwave-capable portables available as of this writing the CC-SW/Redsun is overall as good as it gets anywhere near this price. Quality Control: I was fortunate to have several samples at my disposal to compare for uniformity and several friends own the RP-2100 or CC-SW as well. I am glad to report that I could determine no real operational differences among them which is outstanding in this class of equipment. This radio offers absolutely superb overall performance within the limitations I’ve explained for about $140. It features powerful audio, great RF sensitivity on all bands, two well-chosen bandwidths for AM and SW, a convenient handle, many power options, a feel of solidity and quality and fairly simple operation. The only real negatives include lack of a keypad for direct frequency access plus dim and awkward illumination. So…is the CC/Redsun everything the Eton/Grundig S-350 series is not? In most ways, yes it is – no drift, easier tuning, better SW sensitivity, better AGC and slightly bigger sounding audio. The later S-350 radios offer a slightly controversial “Tuning Lock” circuit which does reduce drifting compared with earlier versions but also gives up some of the naturalness of analog tuning, because you often find the lock circuit fighting you as you try to make minor tuning corrections. Some users prefer the earlier models without the lock. The S-350DL also offers a much brighter LCD display and illumination. The S-350 also seems to have been discontinued. The CC Radio-SW/Redsun RP-2100 and its variants are superb radios and at their price have no competition in the market place.